What are the Mary Lily Research Grants? The Sallie Bingham Center provides research travel grants of up to $1,500 for researchers whose work would benefit from access to the women's history collections held at Duke University's Rubenstein Rare Book & Manuscript Library. The grants are named in honor of Mary Lily Kenan Flagler Bingham. For more information, please see the our main travel grant page. Anyone who wishes to use materials from the Bingham Center's collections for historical research related to the history of women, gender, and sexuality may apply, regardless of academic status. All applicants must reside beyond a 100-mile radius of Durham, N.C., and may not be current Duke students or employees. Travel grants are paid as reimbursement upon completion of research travel after original receipts are submitted. Checks usually take a few weeks to be processed and mailed. International grant recipients are reimbursed via wire transfer. What research projects and topics are appropriate? Mary Lily Research Travel Grants support projects that present creative approaches, including historical research and documentation projects resulting in dissertations, publications, exhibitions, educational initiatives, documentary films, or other multimedia products and artistic works. 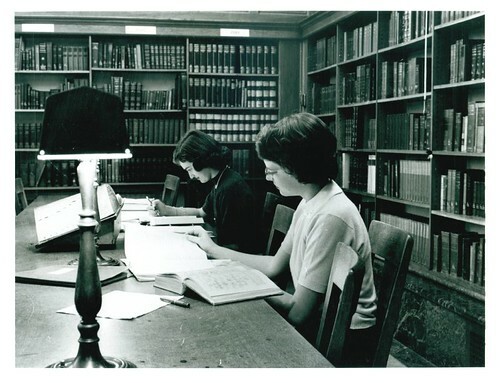 Research projects must use materials from the Bingham Center's women's history collections and include a focus on women or gender. Not all women's history collections at the Rubenstein Library are eligible under the terms of the grant, so please inquire if the collection area is not clear. For example, women's history collections that are part of Duke University Archives, the Jazz archives, or American Dance Festival archives are not eligible. Projects exploring Lesbian, Gay, Bisexual, and Transgender history topics that focus primarily on women's experiences are eligible for a Mary Lily Grant; all others may apply for a Harry H. Harkins, Jr. T'73 Travel Grant. Find more detailed information about our collections in our Research Guides. Inclusion of a collection on one of our research guides does not guarantee eligibility. Please consult with a reference archivist for clarification-we realize this is complicated! All of our materials are included in the Duke University Libraries online catalog. Research topics should be strongly supported by the collections of the Sallie Bingham Center. We encourage applicants to discuss their research projects and the Rubenstein Library collections that might support it with our reference archivist before submitting an application. Submit an inquiry via our online form.